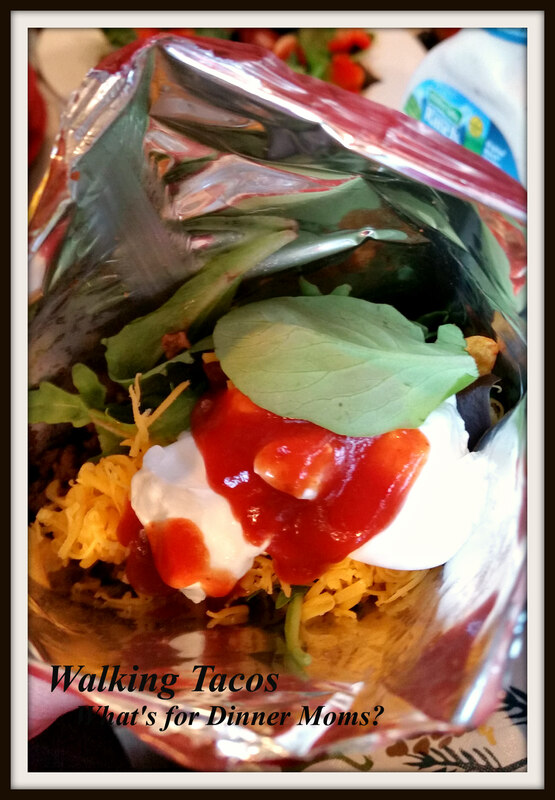 Walking Tacos – What's for Dinner Moms? I forgot I had a 5:15 pm meeting yesterday afternoon so as I was rushing out of the house at 5:00 pm I was thinking that I haven’t even started dinner yet. I knew I had some ground beef and chicken breasts thawing in the refrigerator. What was I going to serve my family though when I got home at 7:00 or 7:30 pm. I couldn’t even tell my family what to get started as I was in such a rush when I left the house I just said goodbye and left. Then I remembered my daughter had bought a giant box of snack sized chips for camp. She doesn’t care much for regular Doritos so I knew there were 6-8 bags in the pantry. We would have Walking Tacos! I was absolutely amazed at how happy this meal made my family. It was simple and when I got home everyone pitched in so that dinner was on the table within 25 minutes. I think they all liked that they could put together their own salad just as they wanted. They could have no onions, or tomatoes, or sour cream if they wanted. It was all up to them. I loved that I was thinking ahead to To-Go dinners. I am always trying to get more vegetables in our To-Go meals and this would definitely help. Just make sure we have extra shirts and plenty of napkins for any drips. My son has already asked that we have these again this summer. He was thinking ground turkey next time. mixture of baby spinach, baby greens, etc..
Each person gets their own personal snack bag of Doritos to make their salad in. Set up a toppings bar so each person can pick and choose their toppings. Slightly crush the Doritos to make them easier to eat and stir through the salad. Top with hot taco meat and choice of toppings. Stir well and eat right from the bag! Thank you! How very true! This is such a fun idea, Marci. My boys will love it. Thank you! Hope they do! Thank you! I hope they do! Thank you! The kids loved it. Hi good to see u! I just recently learned about this. A friend of mine posted on Facebook that he fed his kids walking tacos and I asked what that was and no one on his FB page – including him – believed that I didn’t know what they were. I am thinking is not something we have in California. And for me, the bag is WAY TOO SMALL for my taco salad. I need a trough! We always use ground turkey in our taco salads. And my families version of taco salad is very different than most because I don’t like beans. I am glad your family enjoyed them! Thanks! That is funny! We didn’t have huge portions of meat and we crushed the chips some to make more room in the bags. So, it worked out okay for us.